Deep pink with yellow anthers and white filaments. large 4 3/4" x 2 1/4"
The bloom consists of 27 petals. Some flowers have folded, twisted petals. The bloom has man yellow stamens scattered within. The dark green leaves average 4 1/2" x 1 3/4". 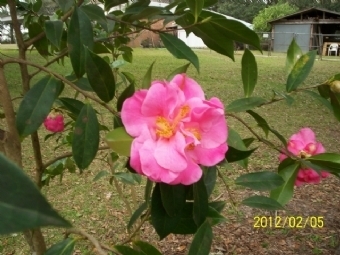 The plant is suitable for landscaping and exhibition uses.